Toolbars — call the sub-menu managing toolbars. Active toolbars are checked. Selection of a toolbar allows to enable or disable it.The "Customize..." command allows to assign any buttons for any toolbars. At that, a new window containing the list of toolbar elements available. The "Insert" and "Remove" buttons allow to add or remove an element from the toolbar. The "Up" and "Down" buttons are intended for defining the location of a button in the toolbar. To reset the toolbar to appear as initially, one has to press the "Reset" button. Status Bar — enable/disable status bar located in the lower part of the terminal window. This data bar contains (from left to right): menu managing profiles, time and prices of the bar selected, and indicator of server connection and amounts of incoming/outgoing traffic. Having pressed on the current profile name, one can open the menu managing profiles. One can store or remove profiles in this menu, as well as download those previously stored.The sub-menu for managing profiles can also be called by the "File — Profiles" menu command. 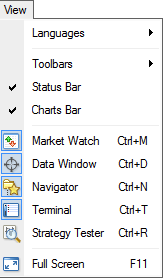 Charts Bar — enable/disable the chart window names (tabs) bar located in the lower part of the workspace. Using this bar, one can switch among open charts fast.